Space Coast Electric Company is an Electrical Contractor located in beautiful Brevard County, Florida. Our Electricians proudly serve all of Brevard County, including: Cocoa Beach, Satellite Beach, Melbourne Beach, Merritt Island, Rockledge, Cocoa, Titusville, Melbourne, and Viera. Our mission is to provide top-notch electrical work at competitive prices. 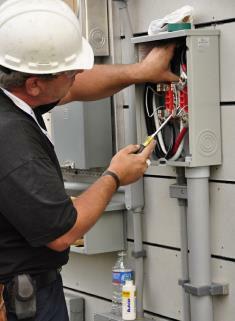 Every job we perform has a Licensed Journeyman Electrician or Master Electrician. A Licensed Journeyman Electrician has tested to show a proficiency of understanding the National Electric Code. This translates to an experienced worker who knows how to perform the work requested. We photograph every job and store the images for future reference. We keep detailed records of the work performed for our customers and clients. This helps us to honor our warranty, know exactly what work we performed and provide the best service possible. We strive to provide ethical and honest assessments of your electrical system, and we will never sell you parts that you do not need. Our goal is to tailor each installation to fit the customer's needs and budget. "After a bad experience with another company we turned to Space Coast Electric for a major remodel project. Now we would not use anyone else. Bill Burton, the owner is always professional, and does great work in a timely manner. He goes out of his way to correct problems we did not know we had including potential fire hazards. Bill is always respectful, easy to work with and has good ideas related to any lighting project. I highly recommend Space Coast Electric." "WOW!!! THESE GUYS ARE GREAT! I do not normally take the time to write a review, but after the experience I had with Space Coast Electric Co. and with the owner, Bill Burton, I felt compelled to share my story. I have had on-going electrical problems in my home ranging from dimming lights, lights switches not working at times, burning smells, etc. I was really scared to go to sleep at night for fear of a fire. I had 2 other electrical contractors out to my home that spent hours looking for the problem and ran up hundreds of dollars in bills. And in the end, neither of them was able to locate the problem. I finally contacted Space Coast Electric and spoke with Bill Burton the owner. After I explained the problems I was having, he came right over. After about 15 minutes of looking and testing my box, he found the problem and was able to repair it! He showed me the burnt wiring and explained what had happened in a courteous and polite way. Since then, I have had Space Coast Electric out to install new kitchen lighting and landscape lighting. When they were finished, it looked like the new lights had always been there with no damage to my walls or ceilings. Oh, and did I mention that they clean up after themselves? The landscape lighting is beautiful and I am always receiving complements from my neighbors. If you need honest and knowledgeable electricians, these are your guys!" "Bill Burton, owner and master electrician, did the work. He came recommended by a carpenter I had do some work recently. I called Bill and he answered the phone immediately. I described the needed work and he gave me a rough price estimate over the phone, then set up an appointment to come out. He called the day the work was to be done to confirm, and showed up on time. Bill is a very affable person and easy to talk to. He did the work efficiently and effectively. He answered any questions I had without hesitation. His original estimate was $100-$125 to do the work, but it ended up being $134.50. I chalk the higher final price due to the fact that I asked a lot of questions, which took time to answer; also the fact that the original estimate didn't take into account installing the waterproof receptacle cover and closet light switch. Bill acted very professionally and did the work needed in a timely manner. He is my new electrical guy; I wouldn't hesitate to call him again." "In this incidence, they added two receptacles in my breezeway. The first time I called them, it was to troubleshoot possible electrical problems with my hot water tank and make several general repairs. This call went just as planned, a great job. The previous call was more complicated. I hadn't had hot water for several years, only lukewarm, and several different service people had looked at it. Bill and Johnny of Space Coast checked out every possible aspect of the electrical, repaired several possible problems and still there was no hot water. Rather than say "well, it's not electrical" and walk away, they stayed and troubleshot until they figured out what was going on (a plumbing problem plumbers hadn't found). I was not only very impressed but very grateful!" "The initial phone call placed early morning was answered promptly by the owner. He dispatched his man who arrived as promised around lunchtime. The repair man was as polite and well-spoken as the owner. He resolved the problem with ease and then proceeded to be certain that all other possible problems be inspected. I would have no hesitation in calling this company again and would highly recommend them for any electrical services you may need." "I sincerely wish to thank you and Eric for a superb job you did installing an electrical receptacle in a location that was very problematic. Two previous contractors did not want to undertake the challenge. You and Eric demonstrated professionalism, excellent workmanship, ability and a determination to get the job done in accordance with National Electric Code, far exceeding my expectations! Cleaning up the job site after completion was very impressive Additionally, I was deeply impressed with your fairness in price, honesty and integrity. Again, thanks for a job well done!"